By Emanuella GrinbergGrowing up in rural North Dakota, about 13 miles from the Canadian border and a 90-minute drive from the nearest McDonald's, Jessica Metcalfe relied on magazines for her pop culture fix. The young Turtle Mountain Chippewa never saw anyone in the pages of Seventeen who looked like her. But as an adult, she's working to change that, promoting the work of Native American fashion designers and artists. She began with the 2009 launch of Beyond Buckskin, a blog that highlights Native designers and discusses their place in media and pop culture. Even Metcalfe was surprised by its initial success--by the size of its audience, the positive feedback, the readers asking, "Where can I buy that?" The blog expanded to include an online boutique last year, placing Metcalfe at the center of a growing movement to reclaim what fashion labels "Native American." She's surrounded by a group of passionate Native designers, artists, stylists, photographers and bloggers who have already proven that by raising their voices they can hold companies accountable. Instead of just reacting to controversies, Metcalfe and her cohorts want to promote authentic examples of modern Native fashion. Their work reflects the diversity of North America's indigenous communities, from the southeastern United States to Canada's Pacific Northwest, but their message is clear: True Native fashion is more than what's for sale at Urban Outfitters or Forever 21.And:The work occurs beyond Metcalfe's website. They're using fashion shows, pop-up boutiques and speaking engagements to spread their message. In March, Metcalfe was in Las Vegas, Santa Fe and Portland for events promoting Native fashion. Keene joined her for a talk this week, aptly named "More Than Just Trend," at Reed College--one of many stops they make on college campuses. Earlier this year, Metcalfe staged a three-day photo shoot of the latest looks in Native fashion, from couture to street wear, with fashion photographer Anthony Thosh Collins and L.A.-based designer Bethany Yellowtail. The result was the Beyond Buckskin Lookbook, which Metcalfe says is the first compilation of modern Native fashion produced exclusively by Natives. They launched the book in March at the Reservation Economic Summit in Las Vegas, an annual gathering of tribal leaders, state and local elected officials and top CEOs from Indian Country. "The lookbook is a brilliant indigenous response to the rip-offs being marketed in mainstream media," said Valerie Taliman, a citizen of the Navajo Nation and West Coast editor of Indian Country Today Media Network, the largest Native-operated media organization in the country. "Here, you have a collection of 17 Native artists with all Native models, photographers, graphics artists and business management--the whole package on their intellectual and cultural terms." So, instead of jewelry that's all turquoise and silver, metalsmith Kristen Dorsey creates pieces she says honors the aesthetic traditions of the Chickasaw people. She works with copper, using the same relief sculpture techniques as her ancestors. Her signature "serpent cuffs" resemble reptile scales, referring to a deity from southeastern Native American spirituality. The cuffs are adorned with black freshwater pearls harvested from the Mississippi River watershed, a nod to where her tribe lived before the Trail of Tears. Each cuff starts at $700.Comment: For more on Jessica Metcalf, see Michaels's Design in Project Runway and Jeremy Scott's Yellow-Crotch Designs. 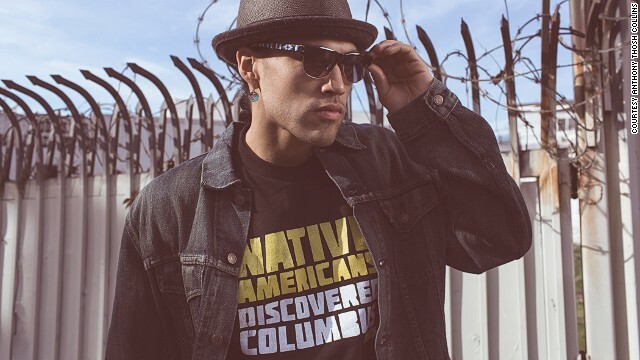 Below: "In this image from the lookbook, model Martin Sensmeier wears a 'Native Americans Discovered Columbus Tee' by Navajo Jared Yazzie for OxDx, Blueberry Copper Earrings by Nicholas Galanin (Tlingit/Aleut), and beaded sunglasses by Candace Halcro (Cree/Metis)." I really want a picture of Columbus with "founder of the Colombo crime family".